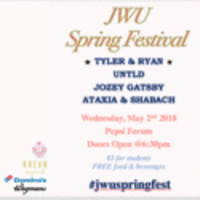 JWU Spring Festival featuring various up-and-coming artists including Tyler & Ryan, Jozey Gatsby, UNTLD, Ataxia, & Shabach! Hosted by Johnson & Wales University Concert Production Class. The concert will be held in Pepsi Forum at the Providence Campus on May 2nd, 2018. Doors open at 6:30pm. Concert starts at 7pm. Live Music, Dance, Games, & Food!